The book is organized according to the steps involved in conducting a meta-analysis within a systematic review. In this report, the IOM recommends standards for systematic reviews of the comparative effectiveness of medical or surgical interventions. The standards are meant to assure objective, transparent, and scientifically valid systematic reviews. Eden J, Levit L, Berg A, Morton S, eds. Finding what works in health care: standards for systematic reviews. National Academies Press; 2011. Higgins JPT, Green S, eds. Cochrane handbook for systematic reviews of interventions [Internet]. Cochrane Collaboration; 2011. Relevo R, Balshem H. Finding evidence for comparing medical interventions: methods guide for effectiveness and comparative effectiveness reviews [Internet]. Rockville, MD: Agency for Healthcare Research and Quality; 2011. 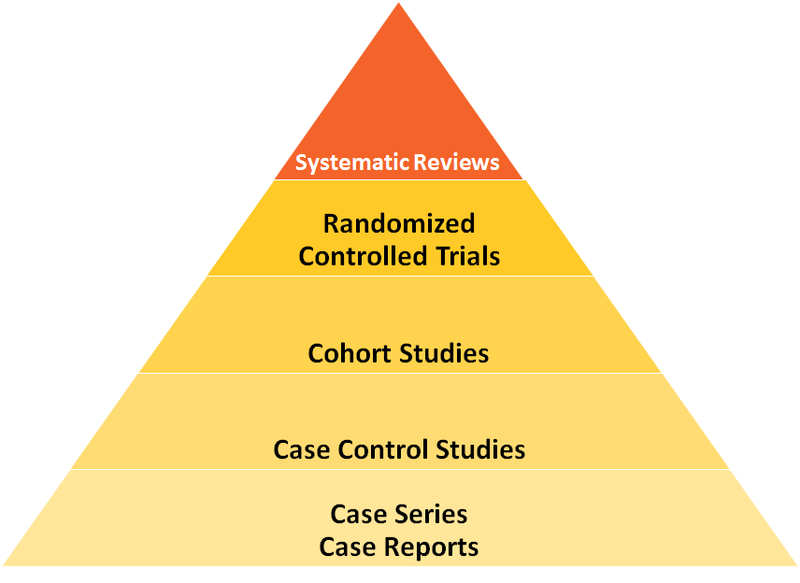 Systematic reviews are considered the highest form of evidence as they are an accumulation of research on one topic. Cochrane Systematic Reviews are considered the most rigorous systematic reviews being done. *Meta-analysis is a method of statistically combining the results of multiple studies in order to arrive at a quantitative conclusion about a body of literature and is most often used to assess the clinical effectiveness of healthcare interventions ("Meta-analysis", 2008). To learn more, see this presentation. Table reproduced from Cochrane systematic reviews handbook. Welcome to the Preferred Reporting Items for Systematic Reviews and Meta-Analyses (PRISMA) website! PRISMA is an evidence-based minimum set of items for reporting in systematic reviews and meta-analyses. PRISMA focuses on the reporting of reviews evaluating randomized trials, but can also be used as a basis for reporting systematic reviews of other types of research, particularly evaluations of interventions. The JBI Reviewers’ Manual is designed to provide authors with a comprehensive guide to conducting JBI systematic reviews. It describes in detail the process of planning, undertaking and writing up a systematic review of qualitative, quantitative, economic, text and opinion based evidence. It also outlines JBI support mechanisms for those doing review work and opportunities for publication and training. The JBI Reviewers Manual should be used in conjunction with the JBI SUMARI User Guide. These standards are for systematic reviews of comparative effectiveness research of therapeutic medical or surgical interventions. Meta-Analysis. (2008). In W. A. Darity, Jr. (Ed. ), International Encyclopedia of the Social Sciences (2nd ed., Vol. 5, pp. 104-105). Detroit: Macmillan Reference USA.